First of all, I want to give a big shout-out and thank-you to fellow linguist Jodie Martin for her wonderful slide show, "So you know a linguist." This short presentation has been passed around a lot on the internet lately, and it does a great job of introducing the field of linguistics to people who might not know much about it. It also makes two points that I especially love: that most linguists would not identify as "grammar nazis" and that we should instead be thought of as language hippies. You can guess why I liked that part! And it's true: we are scientists of language, but we are also its most fervent admirers: the ones who, as Jodie says, "get REALLY excited over an aspirated p, or the history of a word, or using 'Dude' as a gender-neutral greeting." That's why we don't judge forms that aren't in line with the standard. From our perspective, that unusualness just makes them cooler! Jodie's slides make this point quite clearly and humorously, while also sharing a little bit more detail about some of the particular cool things that we study. I think this image speaks for itself, but I made it to respond to the many, many people who criticize someone else's nonstandard language, only to use one or more forms in that criticism that are nonstandard themselves. Of course, I think language criticism is baseless even when it's formed entirely in the standard, but I've been astonished lately at how often I've been seeing sentiments like this one: "Any college graduate who doesn't know proper English should forfeit their degree." If you didn't spot it, that sentence uses the word "their" as a singular pronoun (agreeing with the earlier singular noun phrase "any college graduate"), which is severely frowned upon in academic English. Such instances are ironic, but it is my hope that they can also be teaching moments. If people can come to understand that their own language is never incorrect, I believe that's the first step to realizing the same thing must be true of everyone else's as well. 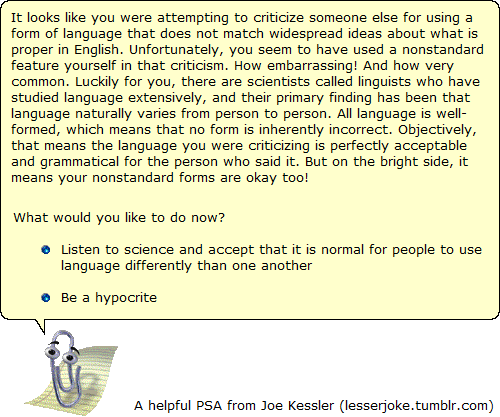 If you feel as I do, welcome (back) aboard the language hippie train! Go forth to tolerate and embrace linguistic variability, and feel free to use the Clippy image for your own potential teaching moments whenever you see a call for them. Ha! Thanks for the shout-out. The clippy image made me laugh. The Clippy is funny, indeed. I am not a native, but I would like to explain how I see the whole thing, from a language learner point of view. I can say, that there are natives repeating: "Your English is incorrect" or "..it is unnatural" (Of course, we can apply it to any other languages, as well). Always so critical. And, I think we all make mistakes....even in our mother tongue. I am a linguistics graduate student with an open mind and a lifelong appreciation of language. You can reach me at http://www.acsu.buffalo.edu/~jtkessle/, or on Twitter at @kessling.